Describe the vision for the Salesforce Ohana Groups. Explain how Ohana Groups create a more diverse and inclusive culture. Abilityforce: Salesforce is a place for employees of all abilities. Abilityforce unites people with visible and invisible disabilities, employees with loved ones who are disabled, and allies. We work to make sure our physical and technological environments are accessible and designed for all by developing and implementing innovative practices that solve customer and employee needs. We aim to cultivate a culture where all employees feel empowered by their abilities and talents, and work to advance our company’s dialogue on accessibility and accommodation strategies. Asiapacforce: Asiapacforce is a unifying resource to empower Salesforce employees, the Asia Pacific community and allies globally. Reflective of the diverse cultures across the Asia Pacific region, our network spans the globe with locations throughout the United States, Europe, and Asia. As champions of Equality, our members partner with corporate and community organizations to implement many educational, philanthropic, and social programs. We accomplish this through public affairs and leadership speaker series, providing career and STEAM education for local youth, and cultural celebrations all over the world. Asiapacforce strives to build awareness, leadership, community, and Equality, all while celebrating the diversity of our culture. BOLDforce: BOLDforce stands for Black Organization for Leadership and Development. Our goal is to expand and empower the Salesforce black community. We provide a platform for employees of color to elevate their voices and develop their careers through a supportive network of allies across the company. 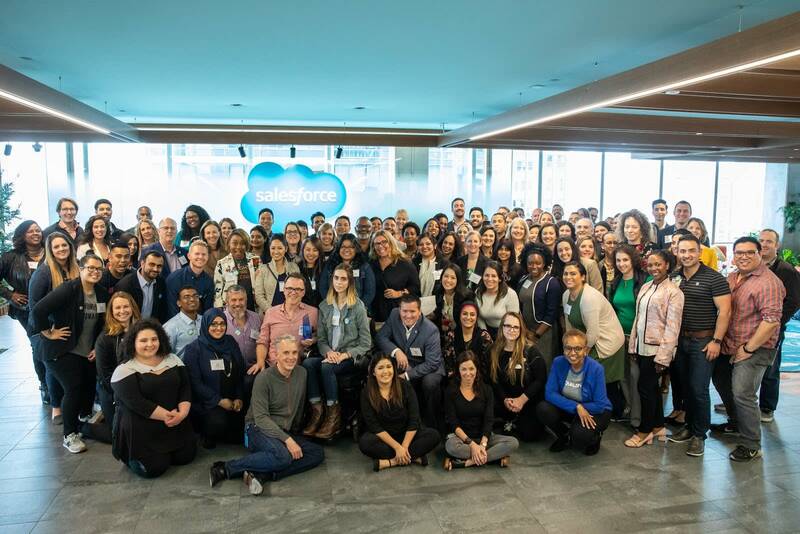 We work to make Salesforce an inclusive place for all by facilitating conversations and managing programs addressing race, diversity, and Equality. Giving back is also a top priority—we partner with organizations to support workforce development and education opportunities for underrepresented youth. Earthforce: We are a group of employee volunteer champions dedicated to promoting and celebrating environmental responsibility at Salesforce. We share a passion for sustainability and believe in equal access to clean energy, air, and water. Our members live green at work and at home while inspiring their networks to do the same. We currently have active member groups at offices around the world, and we host quarterly activities and ongoing learning campaigns. In addition, we work with local communities to create a greener world for all. Faithforce: Faithforce is our Interfaith Ohana Group, established in 2017 to acknowledge, celebrate, and foster understanding of our global faith diversity. With a goal of inclusiveness and empowering our employees to bring their authentic selves to work, Faithforce is open to people of all faiths and allies who wish to learn about the different faith traditions that make up our Global Ohana. Members participate in Interfaith panels, speaker events, cultural and holiday celebrations, as well as work with faith-based nonprofits and interfaith community groups committed to serving those less fortunate, including the refugee populations resettled in our communities. Latinoforce: Our mission is to empower Latinx employees and their allies at Salesforce and within our broader communities. Latinoforce strives to provide our members with a network of support to help them develop their careers, strengthen their leadership skills, and thrive personally and professionally. We are champions of diversity and inclusion with a strong commitment to giving back to our communities through various volunteering and networking activities. Outforce: Outforce brings together employees who are allies of Equality in sexual orientation and gender identity. We promote an open and inclusive culture that empowers employees to bring their whole, authentic selves to work every day. Along with all our Ohana Groups, Outforce also educates our Salesforce ecosystem on how diversity and inclusion create business success. We are out and proud, LGBTQ+ (lesbian, gay, bisiexual, transgender, queer) members and allies, and we celebrate our pride all around the world. Salesforce Women’s Network: Salesforce Women’s Network is dedicated to building gender Equality in the workplace and beyond through empowering, supporting, and investing in our global community for women and their allies. 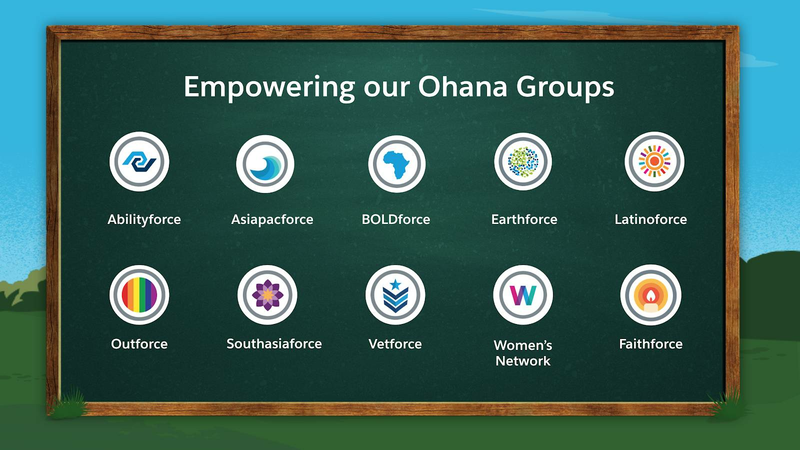 We are the largest Ohana group with 6,000+ members across 30+ hubs globally. Our programs include Lean In Circles, volunteer opportunities, International Women’s Day events, Woman of the Month series, mentorship opportunities, children’s initiatives, and Women in Technology programs. Our focus is always on improving inclusion and Equality for all on the gender spectrum, to help make Salesforce the best place to work for all. Southasiaforce: Our goal is to increase awareness of a growing global South Asian population while connecting employees all over the world. We focus on volunteer work and professional mentoring as a way to give back to our communities and contribute to the advancement of our members. We host events throughout the year to celebrate all of our diverse cultures and share them with our allies. Southasiaforce stands alongside all Salesforce employees as champions of Equality, and strives to bring our global communities together as our company grows. Vetforce: We are a group of veterans, families of service members, and allies passionate about supporting our military. We work to ensure that our company policies are veteran-friendly, and help veterans and families transition to civilian life. Our mission is to foster Equality through recruitment, employment, training, and mentorship of veterans from all branches and all countries of service. Vetforce offers professional development and leadership opportunities within our company, and our members work actively toward advancing and supporting veterans in our broader communities. As you can see, Salesforce is on the path to increasing diversity and inclusion at all levels in our company. We do not have all the answers and we won’t claim to be experts. We are on a journey that starts with transparency and continues with action and dialogue. We invite you to come along.